Aquafaba (bean water) is an amazing ingredient that can be used instead of egg whites, making it a boon to vegans everywhere, including those who thought lemon meringue pie was a ting of the past! In Aquafaba, Zsu Dever’s groundbreaking new cookbook, you will find everything you ever wanted to know about using aquafaba, including a meringue primer, tips and tricks, and Zsu’s fabulous recipes, complete with clear instructions and gorgeous photos throughout. In this book, Zsu shares her recipe for an amazing lemon meringue pie, airy macarons, and light and luscious chocolate mousse,among other confections. There are also savory recipes for burgers, quiche, and much more, including the deliciously crisp latkes (below). In addition, Zsu answers the question “What do we do with all the leftover chickpeas?” with an entire chapter filled with fantastic chickpea recipes such as Curried Caribbean Coconut Chickpeas, Korean Dak Galbi, Pulled Chickpea Seitan Roast, and Shiro Wat. 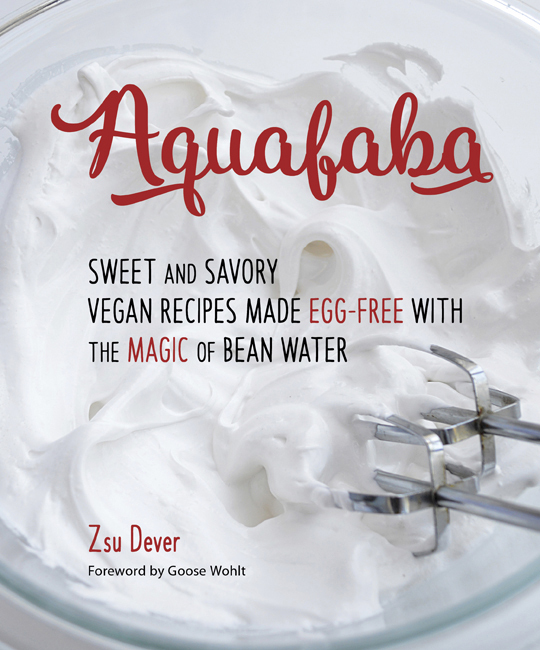 If you’re interested in learning more about transforming the bean liquid you used to through away into amazing sweet and savory delights, you’ll want to own a copy of Aquafaba. 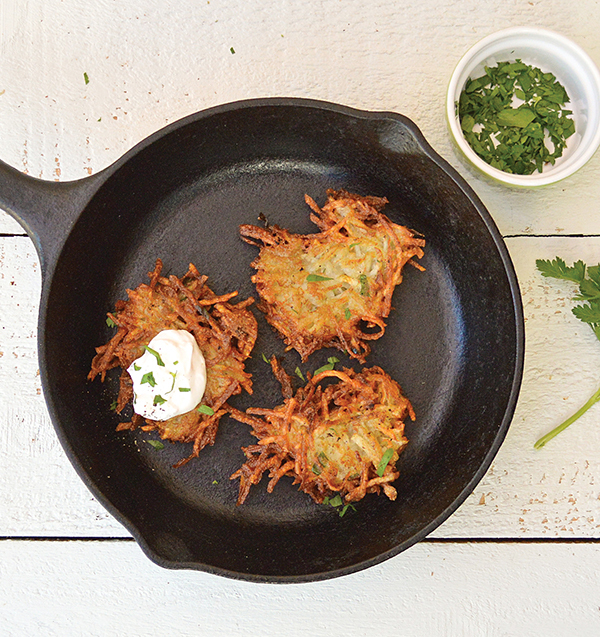 Now here’s that latke recipe…. talks about using Carageenan to make a type of cheese. I must not have been alone when Blue Diamond Almonds was finally convinced to stop using carageenan in their almond milk. There is too much controversy about this additive. I’d love to write to the author but I can’t figure out how yet. I would NOT advise anyone to begin using this additive. Even if the research shows it may NOT be dangerous, there is too much evidence that states one should keep away from it. Just saying. Thank you for your comment. I am aware of the controversy surrounding the ingredient carrageenan, which is why the recipe itself uses agar as the coagulant in the cheese. Having said that, I am also aware that lots of people know about the controversy and still choose to use it in vegan cheesemaking, which is why I chose to include it as an alternative to agar. My role is to supply the recipes and let the home cook decide what is best for them; it is not my place to decide that for them. All the popular vegan cheesemaking books use kappa carrageenan as an ingredient and I felt it proper to offer it as an option to my readers. I hope this does not affect your feelings about the other recipes. I was merely doing my due diligence in offering it in that one recipe as an alternative. I contacted Zsu to respond to your comment. I hope this clears things up for you.